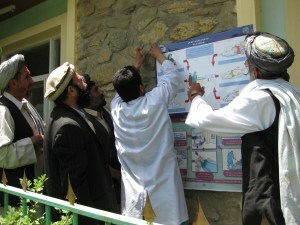 Azimullah, Abudullah Rashid, Mohammad Sharif and Mohammad Nazir discuss messages about birth preparedness and newborn danger signs in Jhpiego-developed posters. 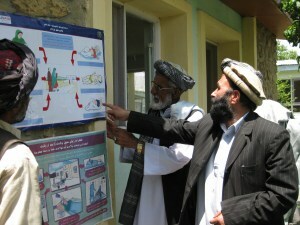 Throughout Qara Bagh District in northeast Afghanistan, tribal leaders have hung posters with illustrations that emphasize the importance of giving birth in a health facility and identify the warning signs of a newborn in distress. The community outreach is part of the work of the Qara Bagh health council, or shura, a locally selected group of tribal leaders who make decisions and resolve community conflicts. The shura promotes healthy behaviors and involves men in the health of their communities. And their work is having an impact. In concert with the efforts of Qara Bagh District Hospital to increase use of health services, the number of women giving birth in the facility with a skilled health provider increased by 128% from 2008 to 2009. Azimullah, the health shura’s chief, explains that a health shura is an appropriate way to engage leaders in improving their community’s health. Afghanistan has a long history of local tribal leadership. The health shura gathers at Qara Bagh District Hospital monthly. The council serves as a link between the health facility and community, advocates on the community’s behalf, mobilizes the community and discusses priorities identified by community members. They give people in the community a voice—that might otherwise be unheard—and promote healthy behaviors. Through the shura, the health facility relays educational messages and updates on health-related activities at Qara Bagh District Hospital, and jointly resolves concerns. In recent months, the community health supervisor has provided the shura key points on preventive measures for tuberculosis, diarrhea and malaria transmission. In turn, the shura has shared these messages with residents in community meetings, or directly with the mullah or village religious leader who incorporates them into his sermons. The posters on display in the district were developed through the Jhpiego-led Health Services Support Project, funded by the U.S. Agency for International Development, which supports the Afghan Ministry of Public Health’s efforts to improve the quality of basic health services, including maternal and newborn care. Health providers recognize the impact that health shuras can have on a health facility and community. Pashtoon Azfar, Afghan Midwives Association President, says midwives are being encouraged to reach out to health shuras and men in their communities to involve them in maternal and newborn health. One of the Qara Bagh health shura’s proudest accomplishments is its role in increasing the number of deliveries assisted by skilled birth providers at the district hospital. Members described the many barriers that prevented women from going to the health facility, including sociocultural concerns regarding privacy, quality of care and lengthy waiting times. After sharing these concerns with the community health supervisor and health facility staff, the shura and facility hosted a regular “open day” at the facility for community members to visit the facility, tour the labor and delivery room and talk candidly with health providers. As a result of the increased transparency at Qara Bagh District Hospital and heightened community awareness, health shura members and facility staff believe that the community is more willing to use the hospital for services. These important efforts by the health shura, coupled with Jhpiego’s work to improve the quality of services in the facility, support the Ministry’s efforts toward meeting the Millennium Development Goals in saving the lives of women and children.